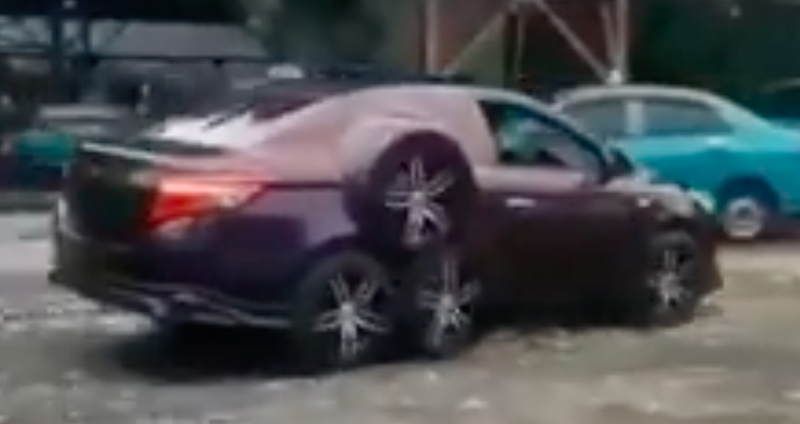 The reliably-wacky internet has yet again surfaced something that has bent my mind into a shape that may never be untangled, this time via a video showing a Toyota sedan with an absurd, tri-axle, six-wheel rear suspension. It is a Toyota mutant, and I’m as afraid as I am intrigued. I have absolutely no information on this machine, other than what I can glean from the video uploaded by Facebooker Dashcams Don’t Lie and shared to Jalopnik’s “The Way Back” Facebook page. The clip shows what looks like a Toyota Vios that appears to be located somewhere in southeast Asia—if I had to guess based on the license plates, maybe somewhere in Indonesia. The video shows the little front-drive purple Vios with aftermarket wheels bolted to two rear axles, the front of which drives a third, high-mounted axle that takes the place of the rear door and window. The bodywork taking the place of the rear window creates a giant, wide wheel housing around the top tires, giving the car a menacing look. I don’t know what the heck is going on here. What are those two high-mounted wheels doing? Are they connected in any way? Do they drive some sort of device inside the car like maybe a flour mill? How are the top wheels held in place, and how is the pressure between them and the wheels on the second axle maintained? It actually looks entirely pointless, which makes it even cooler in my book. This person probably just wanted a unique car, and my god did they accomplish that goal. Update Jan. 29, 2019 12:55 P.M. ET: As reader Amoore100 pointed out, this is actually a Toyota Vios, and not a Corolla Altis as I original thought. And thanks to a comment by JustaTypicalGenZ, we learned that this thing is owned by someone who runs an Indonesian taxi company. In fact, here’s an interview with the man himself, along with some good pictures.